The Decembre 2009 Daring Bakers Challenge was brought to us by Anna of Vey Small Anna and Y of Lemonpi. 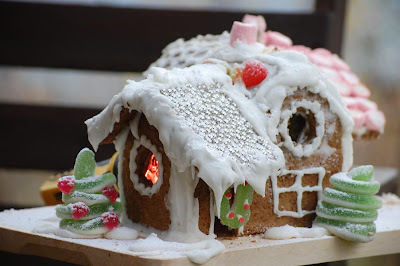 They chose to challenge th edaring bakers everywhere to bake and assemble a gingerbread house from scratch. They chose recipes from Good Housekeeping and from The Great Scandinavian Baking Book as the challenging recipes. I was really excited by this challenge as it seemed like a great idea for holiday decorations, and I couldn´t wait getting started. In fact, this time I had it ready three weeks before due date. I chose Y´s recipe for no other reason that I didn´t have whipping cream on hand and didn´t want to go out shopping to get some. The recipe turned out okay, even though the dough did puff up a bit and I ended up baking two houses, rolling the dough for the second one slighly thinner to facilitate "construction". My "glue" of choice was royal icing that hardened up really fast and tasted good, too (and I liked up quite a lot of it from my fingers while trying to make things keep together). The decoration part was fun, too, melting candies for stained-glass windows and gluing silver drops to the roof, even if in Italy, as usual, it´s difficult when it comes to colourful candies ... I have this problem all the time when using recipes that are heavy on candies or other colourful stuff. That would be so fun! I can only imagine life in a gingerbread house =D. Yours is beautiful!